Well, I FINALLY went grocery shopping, it’d been almost a month! With lots of wonderful family visits in Denver, and camping trips…we’ve just opted to use up our resources in the fridge and pantry in creative ways. But now that I filled up the fridge with great fresh foods and produce, I tend to immediately want to pull it out and chop it all up. So thats what I did, and guys… it all goes really well with tuna! Hence, the salad that resulted yesterday. 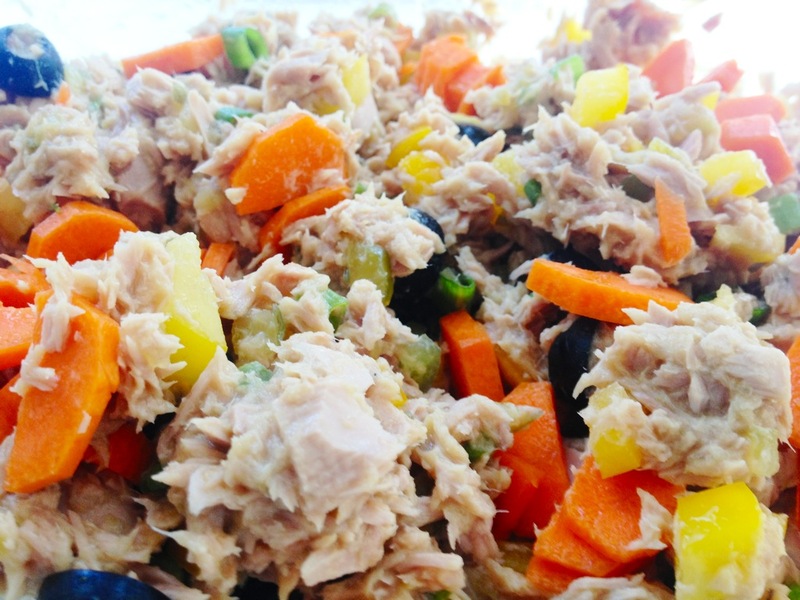 This is not your normal Tuna Salad – it has no mayo (sorry mayo fans!). It’s not like I’m a mayo-hater. I just opted for a more fresh approach, this time ’round. Andy likes this on toast..YUM. I like to eat it right out of the bowl. Or you could do it like a lettuce wrap. So light, but filling. It’s basically a full meal!